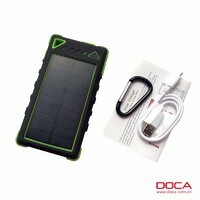 Cellphone portable solar charger for popular mobile phone brands. This well designed metal-cased charger is ideal for the person on the go or anyone planning an extended trip. The pocket sized charger can fully recharge popular brand cellphones in under two hours. The recharger's high capacity (1350mAH) internal battery can be recharged by solar, computer USB, or a standard AC outlet. Buy in bulk for even better discounts, perfect for the accessory re-sale market. Come From Yangfan Electronic Technology Co., Ltd.
Come From Shanghai Jason Industries Co., Ltd.
Come From Ningbo Hi-Tech Zone Polarmate Electronic Co., Ltd.
Come From Xiamen Mars Rock Science Technology Co., Ltd.
Come From Fuzhou YuDachang Trade Co., Ltd.